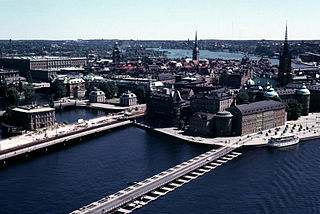 If you only have one day to come to Stockholm, the most suitable place to visit is Gamla Stan. The old town is situated on the island of Stadsholmen This is one of the largest city center in the Middle Ages and has not changed much until now. Synonymous with Gamla Stan Stockholm so that every traveler will surely call if someone called Gamla Stan Stockholm said. Entry into the complex old town of Gamla Stan as if entering the hall. Various forms of medieval buildings with terracotta colors such as yellow, gold, and orange blend meets every corner of the city. I never get tired of watching every building there because everything is unique, antique, and old. Cobblestone hallway connecting each further strengthen the European atmosphere of the past. Narrow winding alleys that made me feel I was in a giant maze. Gamla Stan is a fascinating place to explore on foot. Some central place in Gamla Stan frequented by tourists such as Kungliga Slottet or Royal Palace, the Houses of Parliament or Riksdag Huset, Tyska Kyrka, Storkyrkan, Stortorget, Vasterlanggatan, and Marten Trotzigs Grand. All these places plus a row of souvenir shops, cafes and restaurants became one in Gamla Stan. Once stopped to Gamla Stan can directly go to various places to suit our tastes. Come to Gamla Stan is not enough just once because it is always fun to surround this place. Having visited all the important places in Gamla Stan, I decided to get lost in this place. I always love the sensation when lost, heartbeat, but also curious about the things I would encounter next. I accidentally walked aimlessly in Gamla Stan, in and out of various alleys and narrow hallways and always surprised with all the surprises that give Gamla Stan. In another part of Gamla Stan are filled with tourists, I found a deserted hallway with large trees shade a park bench. Some local residents sitting there, feel comfortable enough to go out and enjoy the atmosphere of Gamla Stan without being disturbed by tourist set. Turn into one of the aisles are not groomed from the crowd of Vasterlanggatan, I found a small hall form a perfect circle, with its fountain as the center of the hall. There is only me, the sound of water, and some low-flying seagull. Without hesitation I immediately took off my backpack and lay down on the stone floor, gives legs a chance to rest after a tired day around the Gamla Stan. A sense of peace and straight into the heart. Either when again I can feel this atmosphere after leaving Stockholm. For now, let me enjoy the atmosphere there.